On the lookout for the Imperial Japanese Army. In 2001, Steven Spielberg and Tom Hanks, both known for their work on the classic war film Saving Private Ryan (1998) released the wildly successful HBO miniseries Band of Brothers, which was based on the book of the same name written by Stephen Ambrose. Given the acclaim that Band of Brothers received, it was only natural that Spielberg and Hanks would follow up ten years later with The Pacific. While Band of Brothers followed a company of US Army paratroopers in their fight against Nazi Germany, The Pacific surrounds three US Marines as the United States fights the Japanese in the Pacific Theater of Operations. Given that The Pacific was made with some of the talent that brought us Band of Brothers, it is inevitable that comparisons between the two will be made in this review. What I noticed pretty immediately was a difference in tone between the two series. I suspect that is a result of the two series being based on two different types of source material. Band of Brothers was in fact a history book which Ambrose researched (albeit questionably as it had the glaring error regarding Albert Blithe’s death in the third episode). On the other hand, The Pacific was based on the firsthand accounts of Robert Leckie and Eugene Sledge (portrayed by James Badge Dale and Joseph Mazzello respectively) as well as Marines who served alongside John Basilone (Jon Seda). With that in mind, The Pacific generally was a much more savage depiction of war. 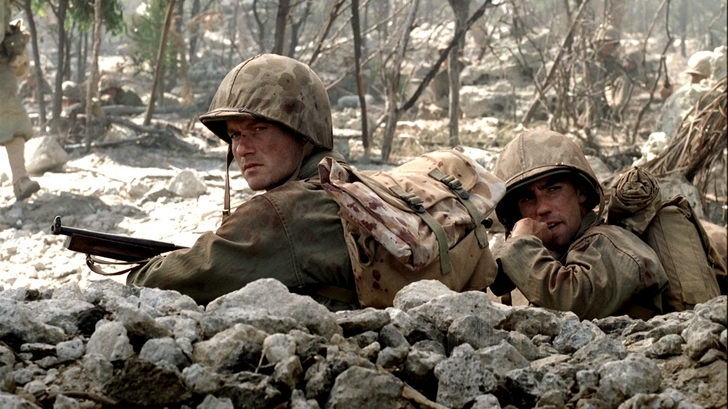 Band of Brothers told a rather heartwarming story about heroic American paratroopers toppling the evil of Nazi Germany, but The Pacific was not so quick to paint the Americans as good and the Japanese as bad as the first episode would show. As the Marines first arrive on Guadalcanal, one of the first things they see is the mutilated remains of other US servicemen. The first American casualty of this Marine division is in fact the result of a friendly fire incident. Throughout the series, The Pacific shows disturbing imagery as many Marines fall back on their primal instinct to survive when faced with an enemy that would rather fight to the last man than surrender. A good example is when the common practice of digging gold out of the teeth of (often still living) Japanese soldiers with trench knives is depicted. The running theme of the show is how many Marines, despite their initial enthusiasm and battlefield experience, are affected by the stress of war. It is in its depiction of wartime conditions that I praise The Pacific. As it is, terrific special effects are something we can expect from HBO shows given the massive budgets they were given to work with. It was definitely the strong scripts and the terrific acting on the part of the cast that really drove home what the Marines were going through. The series really shown in the episodes surrounding the battles at Peleliu and at Okinawa. Also, I thought it was Rami Malek who gave the best performance as Merriell “Snafu” Shelton, a mortarman of questionable mental stability. That said, I felt that The Pacific had a few dents in pacing, particularly during the first half of the series. Band of Brothers focused on the war in Europe from June of 1944 to May 1945, whereas the Pacific started shortly after the Japanese attack on Pearl Harbor and went all the way to V-J day. Both series only had 10 episodes to work with, so it was only natural that The Pacific had to skip ahead in the war’s timeline as much as five or six months at a time. Because of that, I felt I was missing out on what could have been some more character development. I think The Pacific could have benefited from being at least an additional episode long, but I also understand that given the obvious cost of the production, that would have been beyond the budget the producers had to work with. Also, while Band of Brothers was following an entire company of soldiers, they were all part of the same story and thus it made for a very streamlined experience. However, it seemed like Basilone’s, Sledge’s, and Leckie’s stories were all somewhat disjoint in The Pacific. After the battle at Guadalcanal, Basilone was awarded the Medal of Honor and returned home to sell war bonds while Sledge wasn’t even deployed overseas until about halfway into the series. Thus, the story basically jumped back and forth between these three Marines. While it was interesting, I personally would have preferred if The Pacific had more of a focus in its storytelling. Overall, while not perfect, The Pacific is definitely a worthy successor to Band of Brothers. It had a few problems with storytelling, but it did a great job of showing what it was like to be in a foxhole with a Marine who was locked in the struggle against the Japanese and is basically the perfect thing to kick out any notions of war that Call of Duty may have fostered.